Here's some fun shots from the feeder cam we have set up at work. All of these shots are from today. Be sure to click on them for better large versions. First up is a white-breasted nuthatch coming in for a landing just moments after I filled the feeder. 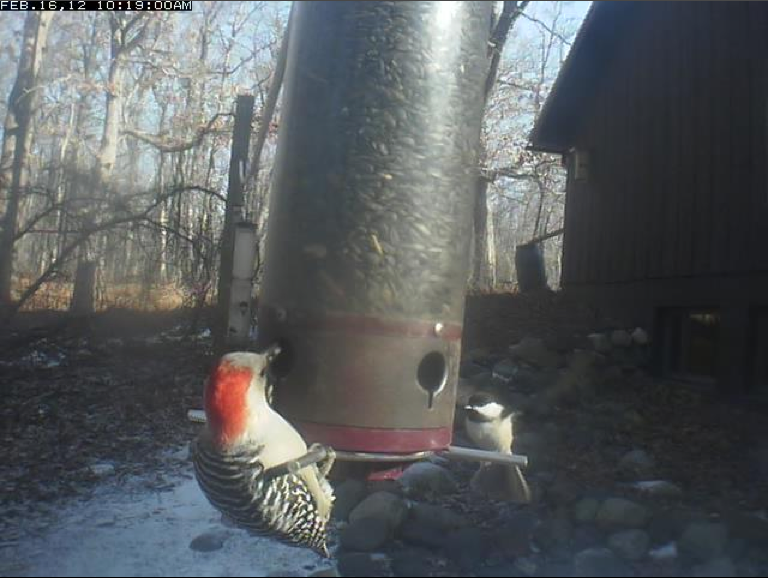 Next is this Red-bellied Woodpecker stopping for a snack. 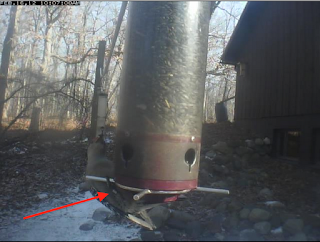 If you look closely, the red arrow is pointing at a bird band on her leg. You can clearly tell the woodpecker is a female based on the next shot. The red on the head does not extend all the way to the front. 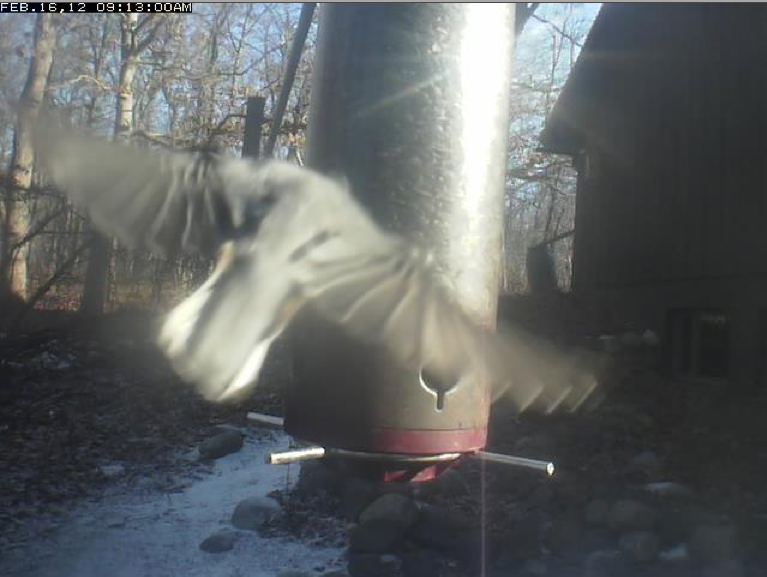 On a male there would not be a gray patch of feathers up front. 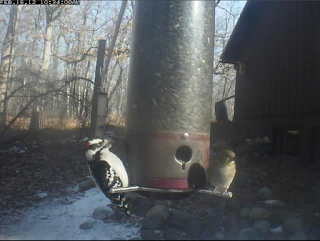 I also like this shot as you can compare the size of the large woodpecker to the tiny chickadee on the next perch. 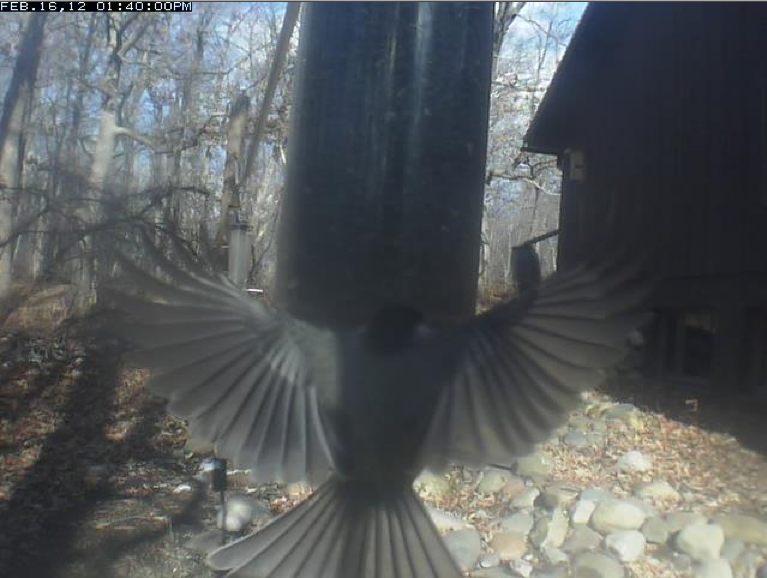 the camera actually captured the chickadee just as it landed. If you click on the photo to view the full size image you can make out the ghostly shape of the birds wings flapping in the air. 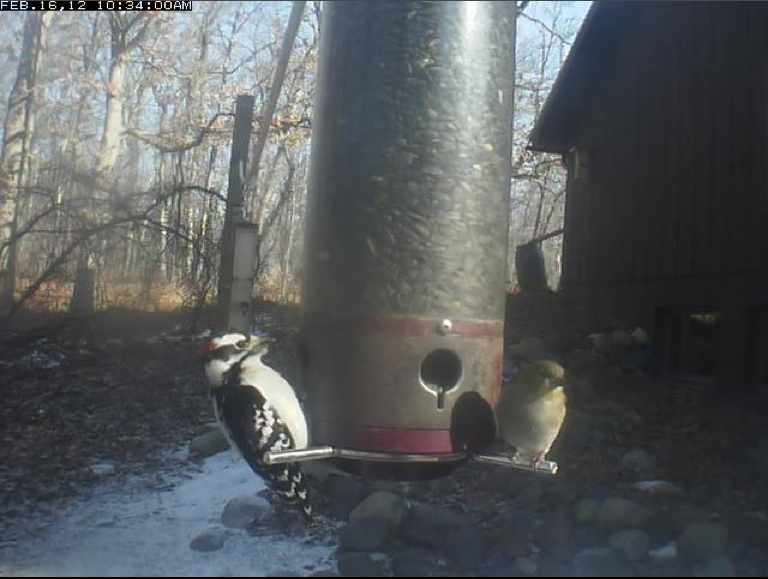 Up next we have this shot of a male downy woodpecker and an American Goldfinch. 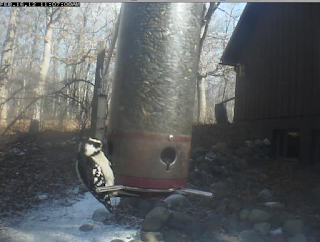 A little while later the female downy woodpecker also showed up at the feeders. 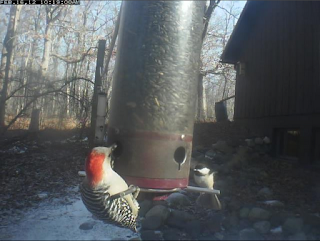 You can see in the photo below she lacks the red on the back of the head. 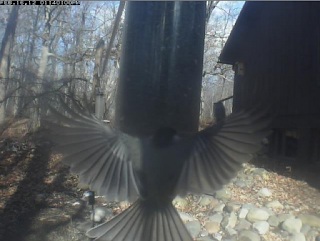 This next shot of a black-capped chickadee is my favorite from the day. You can probably guess why. 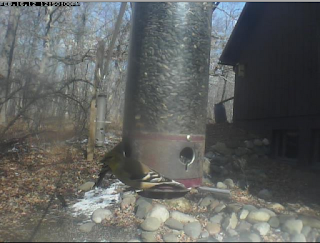 This shot is a little hard to see because the bird is in the shadow but you can clearly see this male American Goldfinch is getting his yellow breeding feathers (especially in the throat), a sure sign of spring. 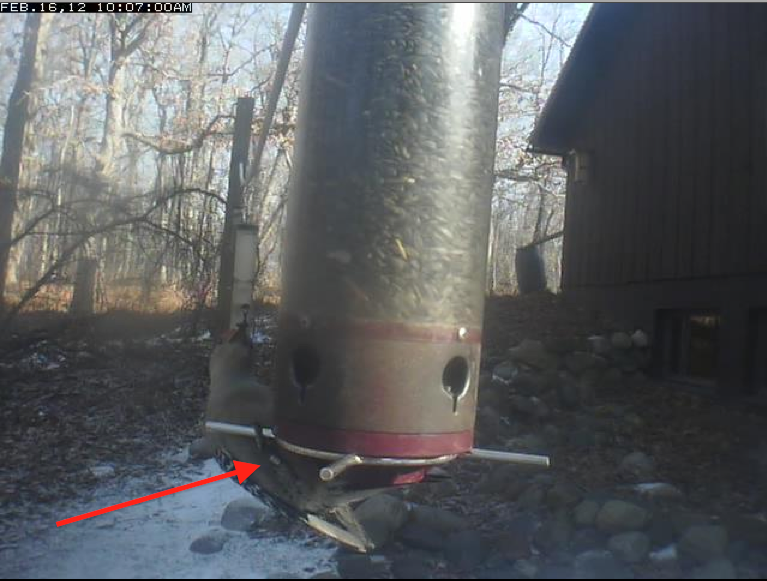 This last photo shows an empty feeder but it is important. This was taken at a little before 3:00 in the afternoon. Note the almost total lack of snow on the ground. Compare that to the first few shots above. 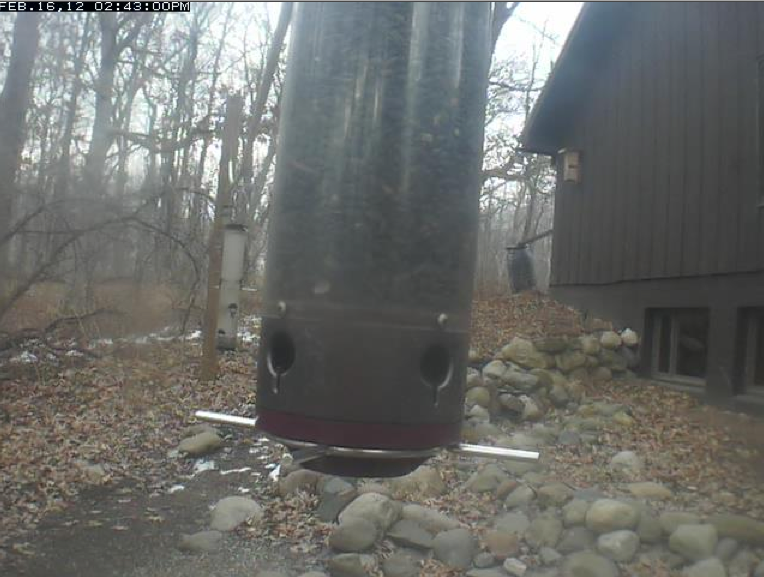 The snow really melted quickly after lunch.